Technology service providers are increasingly gaining prominence in the automotive space, with significant headway being made in areas of powertrain technologies and future mobility solutions. One such company, KPIT Technologies, has been providing a wide array of solutions for the automotive industry. 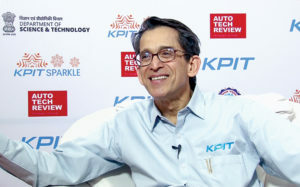 Auto Tech Review recently interacted with Ravi Pandit, Co-Founder, Chairman and Group CEO, KPIT Technologies Ltd to know about the various innovations adopted by the company, future of the industry, and the collaboration between academia and industry. Ravi Pandit is a gold medallist and fellow member of the Institute of Chartered Accountants of India, an associate member of the Institute of Cost and Works Accountants of India, and holds a master’s degree from Sloan School of Management, MIT, Cambridge, USA. The prestigious Tilak Maharashtra University decorated him with an honorary D.Litt in 2014. 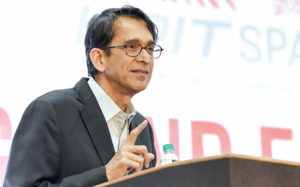 Pandit decided to venture into information technology consulting and services and set up KPIT in 1990 with his co-founder, after having run a chartered accountancy firm for close to a decade after completing his master’s studies. His vision has propelled KPIT to a leadership position in product engineering & IT consulting solutions, and services provider for three industries – automotive & transportation, manufacturing and energy & utilities. Over the last three decades, KPIT has combined its deep industry and technology expertise, presence in relevant geographies, and highly scalable delivery infrastructure to enable clients expand their product development footprint, enhance operational efficiencies and optimise processes. Pandit is a voracious reader, an avid trekker and enjoys listening to classical music. ATR _ Give us an understanding about KPIT’s approach to the global automotive trends of safety, convenience, connectivity and cleaner technologies? Ravi Pandit_ As a company, we are very passionate about mobility, and we like to think that the progress of humanity is reflected in the progress of mobility. We are committed to improving every aspect of mobility, in order for it to be cleaner, safer, and also comfortable so that the long travel times can be utilised more effectively as a result of connectivity solutions. These are the broad themes that are changing the face of mobility, and KPIT is deeply connected with every aspect of these. Almost all new technologies that are entering the automotive space are driven by electronics and software, which is really a sweet spot for us. This is a reason why we are experiencing significant traction from companies all over the world, as KPIT brings to the table the knowledge of both hardware and software. Automotive technologies are over hundred years old; so we in India cannot be at the cutting-edge in an area that is old. However, all electronics features are new and we are on a level playing field when compared to other countries in the world. So we stand a good chance of doing well in this particular space. ADAS are the building blocks for Autonomous Driving. How is KPIT offering such solutions for the advancement of autonomous driving functions/vehicles? There are multiple layers of ADAS from L1 to L5, and KPIT works on offering its solutions across the entire range. We work on feature creation across the various levels of autonomous driving. An example of feature creation is lane departure warning and KPIT develops such features, and in quite a few cases we also own those features, which enable us to license them out to an OEM for application in a vehicle. Therefore, the company carries out a lot of work on feature development for all levels of autonomous driving. Additionally, KPIT also performs a large amount of verification work. A car is a large object that moves on the road and any wrong action of this object could lead to a huge number of casualties and deaths. This requires autonomous driving features of vehicles to be exceptionally safe. While one can argue that machine-driven vehicles are safer due to various reasons, human beings have the power of judgement and years of experience in discerning different kinds of objects and obstacles. The point is to bring this feature of judgement into the car, which involves huge amount of actual driving experience along with vast amounts of data for machine learning and artificial intelligence. All this data leads to verification of features to improve the autonomous driving function. We also work in the area of enabling what is seen through images and translating these inputs into changes that need to be made in the actual driving of the vehicle by the system. This is a very large area of work, and I think KPIT has among the largest ADAS practices in the world coming from a software consulting company. What are your thoughts on India’s 2030 timeline to achieve full electric mobility? How could this plan be realised? We believe that the problems on Indian roads with regards to the urban areas are concerning air pollution, traffic congestion, accidents and comfort. Within these issues, only the pollution part of the problem can be solved if all the internal combustion engine vehicles are substituted with electric vehicles. Electric vehicles also need physical space and would create the same amount of road congestion as any other vehicle. In our opinion, transportation not only has to be cleaner but also shared because that is when the transportation load will reduce. Our strong commitment is to ensure cleaner and shared transportation systems, and that’s the reason we are focussing a lot on buses. The technologies that KPIT is working on in the Indian context are on shared and cleaner mobility, which covers mostly buses. Globally, this is not the same problem, as traffic density is not as heavy as in India and the move towards electric powertrains from internal combustion engines can be the solution. Therefore, KPIT works with companies across the globe for their electric vehicles. However, in India the focus is on electric shared mobility, which gives us a reason to work on electric buses, and going forward we will work on electric rickshaws and electric cars for shared transportation. We believe that the company’s focus on cleaner shared transportation is doable, and also very important. In my opinion, achieving shared electric mobility is possible even before 2030. Please tell us about the technologies and solutions offered by KPIT focusing on the upcoming BS VI standards. We perform a lot of development globally with smart diesel and petrol, along with a lot of work in the area of electronic controls as well as to improve after-treatment. KPIT’s contribution in the case of smart fuels is quite deep, and apart from that the company is also fully-compliant with electric vehicle technologies. We carry out a lot of work on battery-powered electric vehicles, both in the design of the whole battery management system that is at the core, and in the design of control systems to see where and how batteries can be rightly used. We have a number of IPs in that area, and we have also been carrying out work on hydrogen fuel cells. We believe that battery-powered electric vehicles will be a predominant mode of transportation in the urban areas within cities going forward, while inter-city travel could be largely driven by hydrogen fuel cell-powered vehicles. KPIT is working on three parts towards BS VI and they include improving the current internal combustion engine technology, working on battery-powered electric vehicles and also on fuel cell vehicles. The company has also been collaborating with partners for hybrid vehicle technologies. What is your take on different industries merging to offer automotive solutions? Globally, the industry is moving from being asset-rich to intelligence-rich, and we feel there is going to be a significant de-acidification. There is a move from a physical asset (car, truck) to the entire concept of mobility, and this can be achieved through intelligence. The Massachusetts Institute of Technology (MIT) conducted a survey in New York and came out with an algorithm for successful shared transportation. This was achieved through exchange of data regarding the movement of vehicles and individuals. The study showed that this could result in individuals getting a mode of transport within a set time period, under a set amount of walking distance, and resulting in reduction of cabs from 17,000 to 4,000. This survey shows the collaboration between the consumer, telecom company, shared transportation provider and OEM. Additionally, we are witnessing electronic/ software companies coming into the picture to provide an overall digital infrastructure or cloud. We see these types of collaborations taking place and we are really happy as these are for the overall betterment of the society. Lesser the number of assets created, lower is the mining carried out and energy utilised, resulting in reduced heat and CO2 generation. Therefore, this trend of collaborations will only increase in future, and KPIT wants to be an active participant in this trend. How is shared mobility likely to impact future mobility? Shared mobility is going to be the transportation mode of the future whether it is in India or abroad. When we see Japan or urban-America over the last ten years, the number of individuals opting for new driving licences has reduced year after year. This brings to the fore the fact that an average person in those societies doesn’t want to own and drive a car, but would much rather be driven around. Now this is as far as licences are concerned. Even the ownership of cars is reducing. We need to accept the fact that a car is an equipment, which one hopefully doesn’t have to use for more than four hours a day for personal mobility. This means that the car sits idle for a minimum of 20 hours a day. Therefore, the movement of shared mobility is very much driven by the psychology of the user with regards to the economic benefits as well as enabling a cleaner environment. I think most OEMs, even advanced ones, are recognising shared mobility and are essentially talking about formats like tying up with a city and providing everything that is required for such forms of transportation. So their sales and engagement with a shared mobility provider will be much higher than to individual customers. Therefore, shared mobility is a fact of life both in India and in international regions. The only difference would be the actual form of mobility, which could either be buses, rickshaws or shared car rides. What are your views on the transition the industry is likely to take – internal combustion engine to hybrids to EVs to fuel cells? The industry will move from internal combustion engines towards battery electric vehicles for intra-city mobility, and hydrogen fuel cell vehicles for longer inter-city travel. Despite all the efforts to make batteries more energy-intensive, all calculations show that for long distance travel – in the case of a battery-powered electric vehicles – the question arises if one is carrying around batteries or payload. I think the battery-carrying is much higher than that of the payload. It should also be remembered that in the case of a commercial user, every kilogram of battery added translates into one kilogram of less payload, and equivalent monetary loss. Therefore, the drive for a better solution than a battery-powered electric vehicle for long-distance travel is that of hydrogen fuel cell vehicles. Now, the issue of hydrogen fuel cell is the availability of hydrogen, for which relevant technologies are present.